BAYERN MUNICH TICKETS 2018/2019 SEASON Bayern Munich is one of the leading football clubs of Germany, based in Munich, Bavaria. Bayern Munich is the most successful club in German football, having won an impressive 27 German titles and 18 cups (DFB Pokal). Bayern Munich has more than 2,500 officially-registered fan clubs with about 181,700 members making it the most popular club in Germany by far. Buy Bayern Munich tickets securely online now. Bayern Munich is always a serious candidate for winning the Bundesliga title. Also, it is expected that Bayern Munich will do well in the UEFA Champions League. With world class players such as Ribery, Robben, Lahm and many more, Bayern Munich is bound to playing some very attractive football. Not only we have tickets available for Bundesliga 2018/2019 matches, but also we offer Bayern Munich Champions League tickets and Bayern Munich DFB Pokal tickets. All ticket orders are 100% guaranteed. Bayern Munich are on top of the German Bundesliga Table due to the skill, perseverance, and quality of their superstar squad including Franck Ribery, Manuel Neuer, Mario Gotze, Thomas Muller, and Robert Lewandowski. 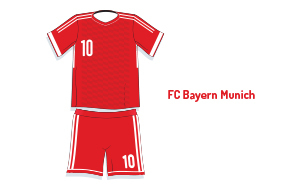 Last campaign, Bayern Munich finished 1st in the German Bundesliga with 84 points. Bayern competes in a group of twenty elite football clubs in the German First Division League fighting to retain their title and to secure a place in the 2018 - 2019 Champions League against other big Bundesliga teams including VfL Wolfsburg, Borussia Dortmund, Bayer Leverkusen, and Schalke 04. Bayern Munich have a loyal, enthusiastic fan base that fully supports Bayern at Allianz Arena matches and away games. Devoted Bayern Munich fans travel to other cities to cheer for their beloved Der FCB side and favorite players! Join in the excitement and fun - sit with other Bayern Munich fans and enjoy the match! You can buy tickets for Bayern Munich at 1st4FootballTickets.com securely online - or you can call our football ticket hotline @ UK TEL: 0871 284 5277! Every Bayern Munich ticket order from 1st4FootbalTickets.com comes with a 150% guarantee, and will be delivered to your home, hotel, or office ASAP by our reliable partners FedEx and Royal Mail Special Delivery.